All steel construction with steel inner walls for more strength and greater durability. Extra tall roller cabinet is just the right working height for staging parts. Ball bearing drawer slides on all drawers provide better performance and hold heavier loads. 5" rubber wheels with a large toe lock on each of the swivel castors (2 swivel & 2 fixed). 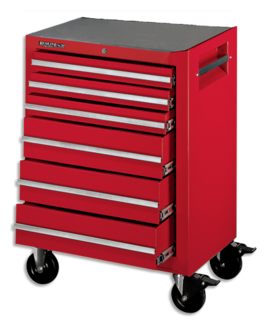 "Rally Red" powder coat paint finish resists rust and solvents.